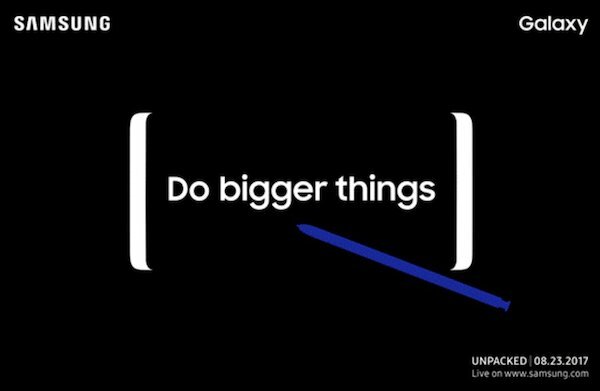 The Samsung Galaxy Note 8 will be unpacked on August 23. The Samsung Galaxy Note 8 now has an Unpacked event date. Seems like Samsung is trying to resurect its Note line; and according to the highly circulated invites, the event will happen on August 23 in New York at 10am EST. Yup, that's a month from now. Samsung is trying to win our hearts back after the fiasco of the Galaxy Note 7. It's very interesting to see how the Korean giant will position the Note 8 since both the Galaxy S8 and S8+ are still raking the numbers. For what it's worth, we are expecting the Galaxy Note 8 to have a bigger display than the Galaxy S8+ in terms of the Infinity Display size. It is pegged to tout a dual-lens camera setup. Samsung is also repositioning of LED flash between the camera and the fingerprint sensor. And as usual, the S Pen will also be the differentiator of the Note line from its Galaxy S brothers. For sure, we will be given more deets of the upcoming Note 8 as we draw nearer to the said release date. Stay tuned.